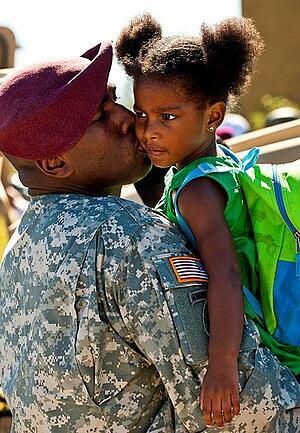 How Does Your School Celebrate the Month of the Military Child? Beginning in 1986 when Defense Secretary Caspar Weinberger declared April the Month of the Military Child, schools across America have recognized military kids in big and small ways. It's amazing the thoughtful and creative events volunteers, parents, and school staff organize and plan in praise of military kids. I recently spoke with Kristen N. who led the Month of the Military Child planning at my daughter’s school in Northern Virginia. Due to the proximity to many DOD and government facilities, it has approximately 25 percent military children in the school’s population. With the help of an eager committee of military parents, she produced a month-long calendar of engaging and inclusive activities for the kids to feel appreciated and have fun. They assembled small and confidential surveys asking military families where their children were born, where they've lived, and other interesting facts to make an attractive bulletin board with family photographs. Later in the month, they will highlight on a map the many geographical locations the kids are connected to. A glass showcase with all branches of military paraphernalia is also visible as the student body enters the school. Each morning during the children’s news time, a drawing for prizes is held from names of the military children attending school. April 8 Wear Your Branch Day Features all military-related apparel and uniforms. April 15 National Purple Up! Day Students, teachers and staff are encouraged to wear purple attire to support military families. April 29 Community Service Day Honor other community service workers by dressing like police officers, fire service members, or others dedicated to public service. Although she acknowledges the need to recognize our military children, Kristen also feels it is important to include non-military families, as they support our kids and school as well. She hopes to incorporate those families with an opportunity to celebrate their relatives who've served in the past or are currently serving by posting their photographs with branch designation. Kristen’s involvement with military families stemmed from her desire to begin Welcome Coffees in our area. Noticing it was difficult to meet new families during the summer due to camps, vacations, and erratic schedules, she wanted to bring neighborhood kids together before the school year began. As an experienced military spouse and mom, she knew her kids would feel more comfortable walking into a new school with a few friends. Kristen was quick to point out April was the beginning of many PCS transitions, including their own. She would like for all families to acknowledge moving to a new home, neighborhood, and school is difficult for any child. She suggests after the moving truck leaves, take a moment to greet the new family in the neighborhood and introduce the kids. New friends are always the best part of any move! Earlier this month, MilitaryByOwner recognized the sacrifices our military kids make and the lessons they learn from multiple moves. MBO also has many articles and blogs to assist with home buying, PCS moves, and much more.